For those interested in Edgar Rice Burroughs’ jungle hero Tarzan, Burroughs historian and author Scott Tracy Griffin released an impressive, comprehensive book back in 2012, Tarzan: The Centennial Celebration. That book detailed the hundred-year history of Tarzan’s literary origins, and how Burroughs’ original character changed in transition from text to film, from film to animation, and onward into comic books, toys, and other assorted media. But within the Tarzan franchise, the film adaptations alone represent a world unto themselves. Griffin’s new book, Tarzan on Film, released by Titan Books, explores the varied adaptations of Tarzan over the years in loving detail. Tarzan has been on film for nearly a century, from Tarzan of the Apes in 1918 (released just six years after Burroughs created the character) to this year’s underwhelming summer blockbuster The Legend of Tarzan (starring Alexander Skarsgård, Margot Robbie, Christoph Waltz, and Samuel L. Jackson). In between, MGM’s series of twelve films from 1932 until 1948 featured Olympic swimmer Johnny Weissmuller as Tarzan opposite Maureen O’Sullivan’s Jane; Disney released a popular cartoon; and Christopher Lambert evoked the Legend of Greystoke. 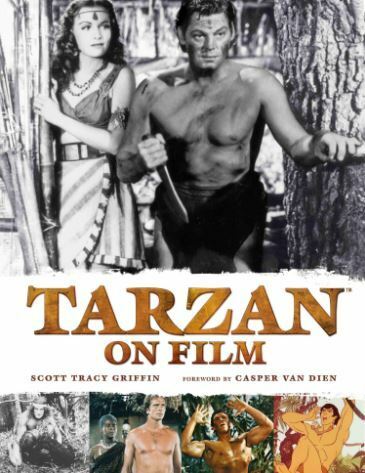 But these well-known examples of Tarzan on film barely scratch the surface of Griffin’s book, which also delves into serials and television adaptations. Indeed, even Tarzan aficionados may find a few surprises or learn of a forgotten Tarzan title showcased in Griffin’s pages. I was surprised to find several, being primarily familiar with the Weissmuller-era black-and-whites, which also featured a lovable chimp-sidekick named Cheeta. Although my more adult, animal-friendly sensibilities today might scoff at subjecting a chimpanzee to the inhumane conditions no doubt suffered on a Hollywood set in this era of filmmaking, my boyish self fondly remembers Cheeta alongside the “Me Tarzan, you Jane” iteration of the character. Elsewhere, I was surprised to learn about the NBC series Tarzan (1966-1968) starring Ron Ely, as well as a few failed-and-forgotten big-screen versions throughout the years. At first glance, Griffin’ hardcover may appear to be a coffee table book. And in a way, I suppose, that’s true. The dimensions (about 10” x 13”) certainly fit the requirements. Paging through, you can’t help but stop on each and every entry, each of which contains a high-quality, full-page reproduction of original poster artwork—gorgeous stuff from an age in which posters were tantamount to fine art. Griffin also assembled a generous collection of publicity stills and behind-the-scenes photos to adorn his pages. However, actually reading Giffin’s text proves the author has painstakingly researched and poured his love into the material. Tarzan has always fascinated me, more in literary form than on film, perhaps because Burroughs’ texts seem rawer and more primal than the commercial Hollywood output. Still, Tarzan on Film instills a strong desire to revisit many of these films, rediscover titles lost in your memory banks, or seek out something you’ve never seen before (there were certainly a few added to my Netflix DVD queue—yes, I still have one of those). Griffin’s book takes a thorough and surprisingly in-depth look at its subject, making this an essential purchase for either Tarzan enthusiasts or those interested in learning more.